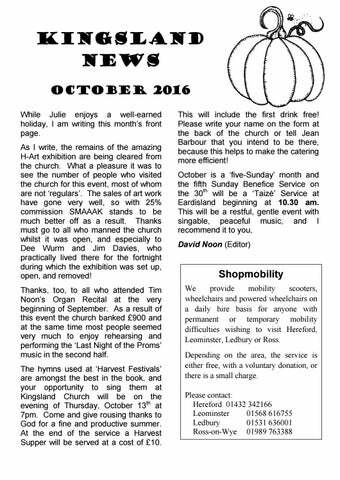 Kingsland News October 2016 While Julie enjoys a well-earned holiday, I am writing this month’s front page. As I write, the remains of the amazing H-Art exhibition are being cleared from the church. What a pleasure it was to see the number of people who visited the church for this event, most of whom are not ‘regulars’. The sales of art work have gone very well, so with 25% commission SMAAAK stands to be much better off as a result. Thanks must go to all who manned the church whilst it was open, and especially to Dee Wurm and Jim Davies, who practically lived there for the fortnight during which the exhibition was set up, open, and removed! Thanks, too, to all who attended Tim Noon’s Organ Recital at the very beginning of September. As a result of this event the church banked £900 and at the same time most people seemed very much to enjoy rehearsing and performing the ‘Last Night of the Proms’ music in the second half. The hymns used at ‘Harvest Festivals’ are amongst the best in the book, and your opportunity to sing them at Kingsland Church will be on the evening of Thursday, October 13th at 7pm. Come and give rousing thanks to God for a fine and productive summer. At the end of the service a Harvest Supper will be served at a cost of £10. Do Otters eat pigeon? The answer is a definite ‘Yes’. What is ‘spraint’? It is the droppings of an Otter, often left on a stone or clear area near to water to define territory. Here, we spotted a blue object in a spraint. On examination this turned out to be a leg ring with a number on it. Considerable enquiries revealed that this ring was fitted to a racing pigeon, purchased this Spring as a squeaker for £75 from a breeder in Weymouth by a Mr Cotterill who lives on Merseyside. The bird, ring-numbered GB16P40947, was entered in a race from Yeovil. The world of racing pigeons is another world. Eddie Hughes of Yarpole can answer many questions. In this particular case did the pigeon drown, or was it caught by the Otter as it drank at the water’s edge? The latter is suggested as the more likely. I found the first wasps nest of the year and decided to let it survive so long as the inmates keep their stings to themselves. Tawny Owls hoot in the early hours but are never seen during daylight. Garden vegetables taste so much nicer for being fresh. Kidney Beans are suddenly over but Autumn Bliss Raspberries are at their best. Are we alone in having an invasion of mice in the lawn and garden? An estimated 20+ were caught in traps set with cheese as bait. They favoured the French Beans being on ground level. Hop-picking time! Few growers left, but now demand is up. Mushrooms around, and Blackberry and Apple Pie is on the menu! R.W.H. Luctonians Sports Club. Much activity, with those employed very occupied in running what is now a large organisation. The second match for the 1st XV against Stourbridge was lost at Kingsland. A high standard of Rugby displayed by both teams, which appears to increase each season. Promotion or Relegation is an ongoing incentive. Lots of roads lead to Mortimer Park, Kingsland. The 1stXV look fit and competitive after much training and practice , although there are already a number of injuries. 2nd and 3rdXVâ&#x20AC;&#x2122;s are going well! New faces most welcome ! R.W.H. Charity Bingo in aid of SHYPPS Betty Lister is to organise a Bingo Evening in the Coronation Hall on the evening of Saturday, October 22nd in aid of SHYPP, (Supported Housing Young People’s Project) a charity which helps young people between the ages of 16 and 25 who are homeless, or who need support in some other way. She would very much like your support, both as a player on the evening, and/or as a donor of a prize for the event. The organisation benefits from support from Herefordshire Council, but due to budget cuts is suffering a shortfall. This event is one of the ways in which the organisation in the Leominster Area is trying to make up the difference. Please help if you can! The doors of the Coronation Hall will be open from 6.30 pm and ‘Eyes Down’ will be at 7.30. HARVEST FESTIVAL Kingsland Methodist Church ALL WELCOME! Theme: Zacchaeus up a tree! Kingsland Castle. In a recent decision the Secretary of State for Culture, Media and Sport has agreed to extend the area to the south of Kingsland Castle motte that is protected as a scheduled monument. The protected site will now include the substantial ditch that runs southwest from the footpath gate leading to the Pinsley Brook along with what is thought be a medieval fish-pond. The newly-scheduled earthwork is a very puzzling feature, which may account for why it was ignored in the original listing. It appears to be the remnant of a very large enclosure that may also have featured a stone wall, traces of which were found during an archaeological survey in 1988. 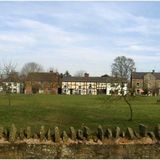 The intriguing possibility is that this was the original site of Kingsland village in the 12th century, close by the castle yet outside its bounds. Or it may be older still, for early chronicles state that Merewald, king of the Magonsaete, had a palace at Kingsland and fishponds were must-have amenities for grand Saxon hallsâ&#x20AC;Ś. Whatever the remains may represent, they are pieces in the jigsaw of Kingslandâ&#x20AC;&#x2122;s long history; pieces that have yet to be slotted in their proper place. Where we are unusually fortunate is that these layers of archaeology are preserved on grassland that is now safe from ploughing or development. They raise questions that cannot yet be answered but will continue to rouse curiosity so that one day, perhaps the true facts will be found. Hamish Scott For official EH designation and map please go to kingslandlife.com A big thank you is due to Hamish Scott for making this happen, Trish Pothecary. Bill Moss Oil Boiler Services of Leominster, your local OFTEC registered oil engineer. Replacement Oil Storage tanks supplied and fitted. Tel: 01584 711372 (Mob: 07711899062) Royal British Legion Branch Meetings. The AGM was held on 12th September with just enough members present to form a quorum. The main points considered were: a. The Balance Sheet for 2015/16 was approved, showing a small gain on 2015. However, our income is reducing and we have therefore deferred a decision on the grant to the Poppy Appeal and Christmastide benevolence until later in the year. b. Branch officers remain unchanged for another year. Richard Brown has kindly offered to take on the post as deputy standard bearer if required. Some Harvest Jokes? As it's harvest, we can expect the jokes to be corny! Did you hear about the magic tractor? It went up the road and turned into a field! Buttercup and Daisy were chatting as they chewed the cud. "'Ere, have you heard about this mad-cow disease?" "Yes, sounds nasty." "I'm glad I'm a chicken." Q. What do you call someone who used to be really keen on farm yard vehicles? A. An ex-tractor fan!